Seven. Million. Dollars. That’s how much Whoopi Goldberg’s soul is worth. This is not a joke — Theodore Rex really is a movie. I have seen it with my own eyes. Hopefully, I will never see it again. I’m considering having my eyes removed as a permanent safeguard. The local ABC affiliate here in New York must have a penny-pinching station manager. The late Sunday movie on channel 7 has been a reliable source of trash-bin dogs since before I moved to the city — straight to video fare that some lowly production company in the back alleys of Hollywood is desperate to pull in any cash on. It’s a perfect storm of bad cinema, a weekly showcase of films that have little to no value, even as camp. Past examples have included Best Laid Plans, American Strays, and The Hillz. All bad, all unwatchable. Last night channel 7 added Theodore Rex to their list of screen gems. This is not an adaptation of the biography of Teddy Roosevelt published a few years ago. 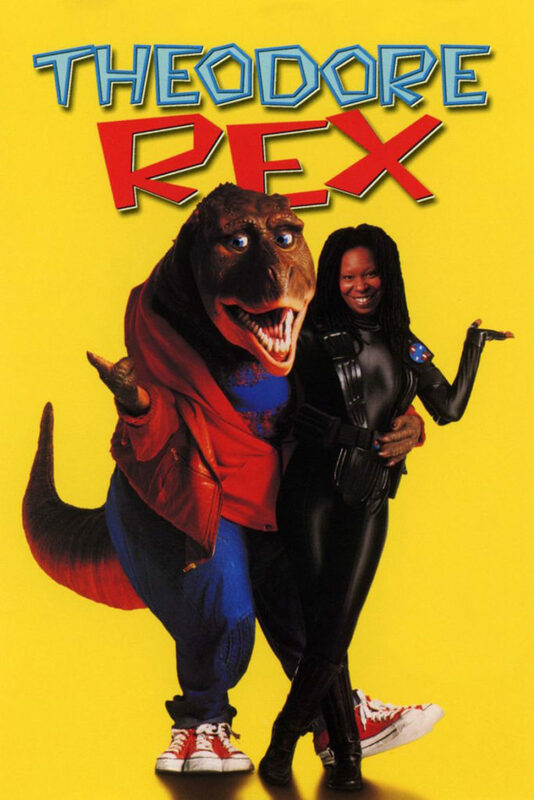 This Theodore Rex stars Whoopi Goldberg and a guy in a rubber dinosaur suit. It’s the future. Whoopi is the world’s toughest cop, and she has a brand new partner — Teddy Rex. He’s a real blast form the past. (Not my writing. Adapted from the film’s actual tagline.) Teddy Rex is hip, gigantic, and has attitude. He can play floor hockey, he wears Chucks, and he’s sooo funny. He can do imitations of Jack Nicholson AND Arnold Schwarzenegger. Theodore Rex is a dreadful movie. It’s a lame attempt to cash in on the dinosaur fad set loose by Jurassic Park. Its creators decided the best way to do this would be to make a buddy comedy. It’s rare to see a film that fails so spectacularly in everything it tries to be. It’s such an unwatchable disaster that I only made it through about forty minutes before I had my fill and went to bed. In all honesty, I made a serious mistake devoting even that much time to Theodore Rex, not to mention the time it takes to write this. I will never get that time back. Not once, from the opening credits to when I stopped watching, did I expect a turnaround, but I still hung around for over a half hour. For shame. The jokes are bad, and the costumes are worse. The Teddy Rex and other dinosaur suits are so clunky and amateurish that their awkwardness was worked into the plot. Whoopi Goldberg plays her part as if she would rather be anywhere than making this movie. As it turns out, that’s not just keen observation on my part. Goldberg tried to back out of making Theodore Rex but was taken to court to force her participation. However, there’s no need to fret over Whoopi’s well being. She still took home a nice payday. So while one may think Whoopi has a constant frown on her face in this movie, that’s actually a seven million dollar smile. So what, exactly, other than the awful concept, inept production, and stench of career death drove Whoopi away? Maybe it was the underlying struggle of the dinosaur race in the movie. The dino characters had a plight not unlike the American civil rights movement. Teddy and his brethren were a repressed minority struggling for equal treatment in a society both hostile and at times blithely unaware of its cruelty to the dinos. Such a deep and touching subject is treated as a joke, and it was painful watching not just Whoopi Goldberg, but Richard Roundtree, participate in it. Oh, and Whoopi’s character was named Coltrane. The producers dropped over thirty million bucks making Theodore Rex, and wisely sent it straight to video. However, thanks to the suits over at ABC 7 in New York, a film from the ash heap of cinematic history saw the light of day for at least one more time. Lest I let the nameless producers and the suits take all the blame, Theodore Rex was written and directed by Jonathan Betuel. As proof that there is some justice in the universe, as of this writing Mr. Beutel has zero credits after this piece of garbage on his IMDb page. It appears it destroyed his career. Excellent work, gentlemen, from every one of you that brought this unique cinematic experience into my home. I shall never forget it. Theodore Rex makes Alien: Resurrection look like The Godfather. Next Next post: Missile Test Predicts!